Katie is 17 years old. and 5'7'. She was born in North Wales and, although she is not fluent in the welsh language she can get by. Katie is currently a drama student who excels at everything she does. Her passion is performing – singing and acting..
Katie has always been a 'performer' and, as a six year old 'drama queen', she had the lead role in the school play, 'Alice in Wonderland'. Her first performance in high school was when she won the school talent competition singing Eva Cassidy's 'Somewhere Over the Rainbow'. Katie also took part in the school production of 'High School Musical'. Since year nine Katie has really been interested in all aspects of performing arts. She has a passion for acting and, having such a good singing voice, means a lot more possibilities are available to her as a performer. 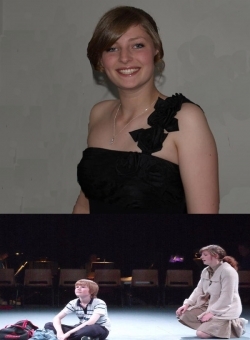 In September 2008 Katie joined Llandudno Youth Music Theatre which is an amateur performing arts group. Last year they were lucky to get the rights to perform the big hit west end musical 'Billy Elliot'. Katie played one of the main characters, Dead Mam, and had two solos. This was a fantastic opportunity for her and she is looking to following to heart and take acting up as a career.